Upon hearing of "Barber coinage", a non-collector might conjure up an image of a barber shop pole stamped on a coin. Actually, the term refers to the design of the U.S. Dime, Quarter, and Half Dollar, created by Mint Engraver Charles Barber and produced from 1892 to 1916. After a failed attempt to secure a new U.S. coinage design through a public competition, the job eventually landed on Barber's desk. Some scholars conclude Barber had a hand in sabotaging the competition, for as a the only government official on the three man judge panel, he certainly was in a position to do so, and made no secret that he wanted the honor. At about the time Barber began conceptualizing his coinage, improved manufacturing techniques were brought to the Mint, which made it possible to include smaller, more precise elements in coin making. 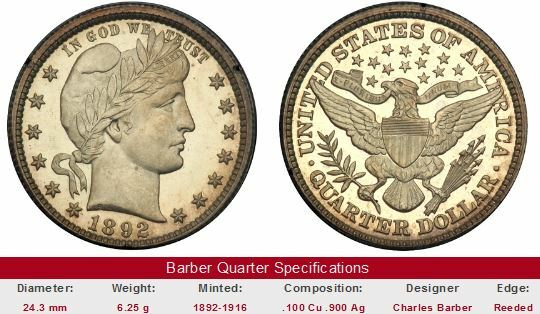 Barber utilized the updated technology to load up the reverse of the quarter and half dollar with many complex details. Some criticized the "busy" layout of Barber's design. A uniquely American musical genre called ragtime enjoyed its greatest popularity during the period of Barber coinage production. The distinctive syncopated melody of ragtime filled music parlors and dance halls in those years. 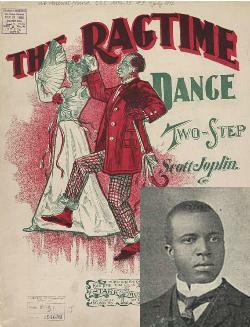 Scott Joplin (inset above) is recognized as the "King of Ragtime" for his important contributions to classic ragtime. The new coins became a presence in everyday life, during an era of great transition for the nation. During this time, the United States took a place on the world stage as a major military power and industrial giant. Barber coinage continued until 1916, when ironically, it fell victim to same complaints that led to its origin. Key date Barber Quarters are offered for sale below through eBay coin auctions. The left hand side of each "Sales Box" is value trend data over a long period of time for a coin of that date in Good-4 condition. The percent annual increase since 1950 is computed for comparative purposes. To protect your investment, DO NOT buy any Barber Quarter key dates, or any rarity for that matter, unless they've been certified by PCGS, NGC, ICG, or ANACS, or from a reputable dealer. The coin pictured for sale in the right hand side, if any, is not necessarily the same condition coin or same variety as that represented in the value trend analysis on left hand side.